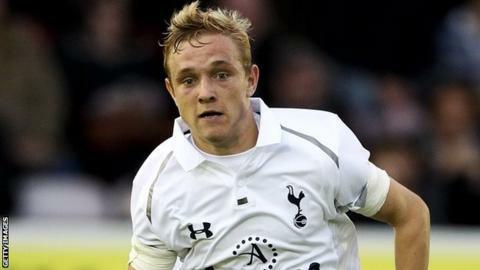 Peterborough United's on-loan winger Alex Pritchard is expected to be out for six weeks with an ankle injury. The 19-year-old has featured twice for Posh but is receiving treatment at his parent club for torn ligaments. "He's come on in both games and done quite well," Posh boss Darren Ferguson told BBC Radio Cambridgeshire. "There's a possibility of getting him back. Tottenham are going to give him an injection that will hopefully speed the recovery." Pritchard is set to be with Peterborough until the end of the campaign. Posh have had little luck with loan signings this season. Manchester United defender Scott Wootton is also out for six weeks with a hamstring injury after signing a loan deal until may and striker Saido Berahino had to return to West Brom earlier in the season when he chipped a bone in his knee. "I think we're cursed a little bit with the ones we've signed on loan," said Ferguson. "Up front is one area I may look to bring somebody in but at the moment I'm fairly OK with what I've got. "It depends how quickly Saido were to recover. If he were to recover and we had an opportunity to bring him back we would probably look at that." And the London Road boss has not ruled out a return to the side for Tyrone Barnett. The forward was loaned out to Ipswich after a breach of club discipline, but came back to Posh in December with a knee injury. "I'm not going to cut off my nose to spite my face," said Ferguson. "Since he's come back into the building the boy has knuckled down and got on with it. But I expected him to."